This candle produced usable light for approximately 1 hour. I used velvet leaf cordage wick. Here is another way to capture light. 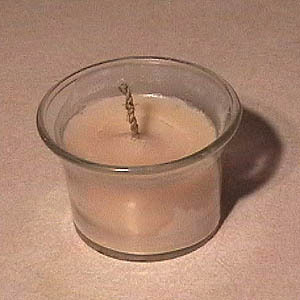 Make a candle out of tallow and a natural fiber wick. The container could be a holder made of fired clay. Shown here is of course glass. 1). Fill your holder with warm tallow. 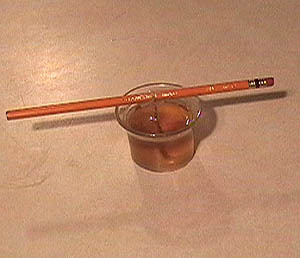 Then Place the wick in the center of your candle holder or mold and place the stick across the top. This suspends the wick and holds it in place. Allow the tallow to cool and solidify. 2). 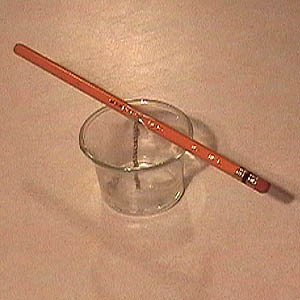 Take a small stick, twig, or even a pencil and fasten your wick to the middle of it. 3). Voila! A tallow candle. This size, which I used an old wax votive glass holder, lasted approximately 1 hour.